This calculator is meant as a guide only. For an official quote please send us a drawing & details of your requirements or you can speak to a member of our sales team on 0161 480 0828. To view our full range of colours and select the one you want from our gallery please click on the picture on the left. Please measure the length and width of each worktop piece that you require and enter them into the boxes below. Include any other units such as breakfast bars, island units etc. Price is based on 30mm thickness granite. Please ensure your measurements are in millimetres mm (1m = 1000mm). Based on a 620mm depth the longest run we can guarantee without a joint will depend on the material selection for granite and is always 3000mm for quartz stone, ask a member of our sales team if you have any questions regarding the longest run. These are the edges of the worktop that are visible and would need polishing. Price is based on straight edge polish with chamfer (other edge profiles available on request). Please ensure your measurements are in millimetres. Polished cut-outs are the cut outs for under-mounted sinks etc. that have the inner edges exposed and to be polished, (single hole) carried out on CNC machine. Double polished cut-outs are cut-outs for two under mount sinks next to each other that have the inner edges exposed and polished, (double hole) carried out on CNC machine. Unpolished cut-outs are the cut-outs with an inner edge that will not be visible such hobs and surface mounted sinks etc, Manual cut out (un-polished cut). These are the cut-outs for taps and switch holes, i.e. 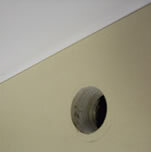 waste disposal, most tap holes are 35mm standard, if this is not the case then please consult a member of our sales team. Drainer grooves are four straight grooves (1 set) in the worktop next to the sink which act as a draining board. The granite is milled down and re-polished to create a drainage area running into the sink. 1 set of drainer grooves is included. Up stands can be used instead of tiling the walls. Please measure the total length of up stands required. Price is based on 70mm high 30mm thickness granite. Please ensure your measurements are in millimetres, if you require anything different to the standard sizes please call our sales team. This is the piece of material granite or quartz which can be used behind the hob, range and sink to protect the wall from splashes. You can also have full height splash backs which are positioned on top of the granite work surface to the underside of the wall units. Measure the length and width in mm of each splash back piece that you require and enter them into the boxes. Please ensure your measurements are in millimetres, please note that a socket cut is charged at £25.00 per socket. At Universal Granite we believe that we offer the best value for money for the high quality granite and quartz worktops and services we offer in the UK. If you get a more competitive genuine like-for-like, fully itemised quote that is for the same premium grade granite or quartz, the same high quality fabrication process with the latest CNC technology and can be fitted within 7 working days of template then please send through a copy and we will do our utmost to beat it. Please fill in the form below to get the total price or you can speak to a member of our sales team on 0161 480 0828. For further information please complete below and submit the form.